1. The kids love it! 2. Students of all skill levels have success. 3. Students actively participate for the entire period. 5. Introduces students to an activity that they can do alone or with others. 6. The pride and excitement of non-skaters when they learn to skate. 7. Easy to adapt lessons to include all skill levels. 8. The increase of self-esteem when mastering a new skill. 9. Promotes cooperation as students help each other. 10. The activity can be done inside or outside. I am proud to say that this is our 14th year of skating with our fifth and sixth grade students. The Skate in School program has proved the test of time and continues to be one of our most popular units of study. Our students are getting a great aerobic workout and having fun doing it. Even our novice skaters enjoy the program. They start out only able to walk on grass and end up skating on the blacktop. It is just amazing to witness their success and increased self-esteem. We have really grown up with the program along with the help of the people at Rollerblade and, especially, with the Skate in School program. Over the years, we have moved from an indoor-only activity to an indoor and outdoor program. We had to deal with maintenance and storage issues as well as finding ways to support the program with our budget constraints. Skate in School was always there for us. As a "Roll Model" ambassador, I am able to pass along information to other professionals and help promote this wonderful program. In February of 2008, I presented our Skate in School program at our New Jersey AHPERD Conference in a presentation called, "You Can Really Integrate In-Line Skaing into Your Curriculum." You can download a copy of my presentation here. The Teaneck School District respects the goals and expectations of a comprehensive health and physical education program. As physical educators, we understand we are competing with math, language arts and other content areas for district dollars. We have earned the support of administrators and parents by providing a quality program and understand our role in ensuring the health of our students. The Skate in School program was featured in a news story that aired multiple times on more than 600 USA Radio Network stations nationwide. It also aired on XM Satellite Radio and the American Forces Radio Network. A recent study by Johns Hopkins University researchers said regularly skating, Rollerblading and biking increase children's chances of fighting the flab as they grow. The odds were better than for those who played baseball and other organized, and often seasonal, sports. The study, published in January's Archives of Pediatrics & Adolescent Medicine, was one more among the many seeking solutions to the nation's growing obesity epidemic. But it's one researchers believe will fuel the push for more school and after-school activities. "Skateboarding is not a sport; it's a way of life, a culture," said Jason Chapman, a longtime skater and the 34-year-old owner of Charm City Skatepark in Canton. "You don't go out and play one game and go home. You skate all the time and every day. I still skate every day, and I'd hate to see what I'd look like if I didn't." Brenda Welty brings her 13-year-old son, Dakota, from York, Pa., to Canton five days a week and agreed skating is good exercise. Dakota's effort has brought high marks from Dakota's doctor for his muscle tone. But not all kids are in good shape. About 16 percent of adolescents are overweight or obese, three times the number in 1980, according to the Centers for Disease Control and Prevention. Studies have shown about 85 percent of overweight kids become overweight adults. The CDC says more than a third of high-schoolers do not regularly engage in physical activity, and almost two-thirds of 9- to 13-year-olds do not participate in organized activity after school. All the slacking, along with video-game playing and processed-food eating, among other possible evils, may be to blame for more than a weight problem that researchers say frequently troubles people through their lives. Medical problems surfacing at younger ages are costly in human and health care terms. Researchers, including those at Hopkins, have endeavored not only to show prevention is easier than treatment, but what methods of prevention work best. The Hopkins study included 3,345 mostly healthy-weight teens in grades eight through 12 who were surveyed on their participation in physical-education class and after-school activities. The researchers followed up five years after they left school to check their height and weight. They found that among after-school activities, the likelihood of being an overweight adult was reduced 48 percent for those who skated or biked more than four times a week. For those who played soccer or other organized sports three or four times a week, the odds of being overweight later were reduced 20 percent. Thanks to a $3,300 grant from The Lancaster Foundation for Educational Enrichment, sixth- through eighth-grade Reynolds students now participate in Skate in School, an in-line skating program designed to give them an alternative to traditional gym classes. Developed by Rollerblade and the National Association for Sports & Physical Education, Skate in School is part of a national movement toward increased fitness and self-esteem among youth. 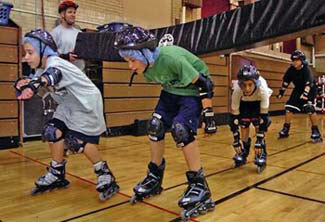 Students at Reynolds skate in the gymnasium during their regularly scheduled gym classes. They start out with the basics: learning to walk, stop and fall. Later, they begin gliding around the gym. Eventually, they learn the more advanced techniques of turning, crossing over, skating backward and simple tricks. Since it began in 1996, Skate in School has helped more than 1,000 schools acquire in-line skates and protective gear at special prices. It also provides teacher guides and lesson plans for in-line skating activities. Reynolds phys-ed teacher Ed Yohn said gym teachers at the school became interested in in-line skating before the beginning of last school year. "We wanted to do rollerblading because we wanted to continue our path of getting away from traditional P.E. activities, and we wanted to pursue other activities that could lead to lifelong fitness," he said. Because in-line skating is more individualized, it is part of a larger trend toward gym programs that foster noncompetitive sports, a direction Reynolds gym teachers want to pursue. "We stress more team building and cooperation in sports and the values that go along with them, such as sportsmanship and fair play," Yohn said. In-line skating also improves the overall fitness of students. Major benefits are better cardiovascular fitness, endurance and muscular strength, he said. Yohn said he hopes in-line skating will encourage students to participate in an activity they can pursue throughout their lives. "It is a lifelong fitness activity, and hopefully some of the students will go out and buy skates and do it for enjoyment," he said. Reynolds seventh-grader Sophia Witmer said she enjoys skating so much she asked for a pair of in-line skates for her birthday this month. Other students also have responded enthusiastically. Even students who were unwilling to try other physical activities were eager to skate, Yohn said. "I know they enjoy it; there's that instant gratification of enjoying something different. It's been really nice to watch." Ashlei Dejesus, a seventh-grader, said in-line skating is "exciting because it's not something we usually do ... I couldn't wait." Another seventh-grader, Susanna Selch, said she enjoys learning to trust herself on skates. "You know you can do it if you try," she said. "You have to keep trying if you fall." Yohn said he is not concerned about safety risks or injuries because students are required to wear helmets and wrist, elbow and knee pads. "We've had no injuries to date," he said. "With all the gear, it makes it really nice. The Skate in School program packages are beautiful, and everything is built in to eliminate problems." The equipment would not have been possible without the foundation grant, School District of Lancaster spokeswoman Kelly Herr said. Yohn is hoping the district rotates the skates and equipment to other schools so their students can participate as well. "It's a great avenue for kids of all ages and sizes," he said. "It's just a great possibility."